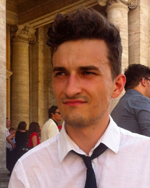 Siarhei Biareishyk is a PhD Student in the Department of Comparative Literature at NYU, received his B.A. at Macalester College, and studied at Humboldt-Universität zu Berlin on a DAAD fellowship. His interests include: literary theory; German Romanticism and Idealism; Stalinist culture and Soviet Marxism; Spinoza – Hegel – Marx line of inquiry; the relationship between literature, philosophy, and psychoanalysis. He is the author of an article “Come Out to Show the Split Subject: Steve Reich, Whiteness, and the Avant-Garde” (Current Musicology 2013).